We have all heard of Somnath as one of the major pilgrimage sites in Hinduism, which is dedicated to Lord Shiva. However, did you know that Somnath is believed to the first of 12 jyotirlingas in India where Lord Shiva appeared in the form of a light? There are several other interesting legends which are related to this historic temple, which draws tourists and devotees from all over the world. Located in Gujarat, it is easily accessible from Ahmedabad. So, how about a trip from Ahmedabad to Somnath Temple now? Read on to more about its history and learn about its period of formation, destruction and renovation. As the region around Somnath Temple experiences a hot and humid climate during the summer season, it is advisable to avoid visiting Somnath during summers. If you are looking forward to enjoying the cool weather while sightseeing, then the best time to visit Somnath is from October until the end of April. By Air: You can take a flight to Diu Airport and then from there, you can hire a cab or catch a bus to Somnath. Diu Airport is located at a distance of around 65 km from Somnath. By Rail: The nearest railhead is at Veraval, which is at a distance of 6 km from Somnath Temple. You can catch a train from Ahmedabad to Veraval Junction. However, route 2 is the fastest as it will take 40 minutes lesser in comparison to route 2, thereby, helping you reach your destination within 7 hours. While on your way to Somnath Temple, you can take a break at the following places. One of the fastest growing cities in Gujarat, Rajkot has its fair share of history in the development and prosperity of the state. Being home to Mahatma Gandhi, Rajkot was a significant town during the time of struggle for independence in India where certain movements against the British rule were carried out. There are several historical places of interest in Rakot, which include Kaba Gandhi No Delo, Mohandas Gandhi High School, Watson Museum and Ramakrishna Ashram. Junagadh should be your stoppage en route to Somnath Temple as the history of Junagadh dates back to the era of the Mauryan dynasty and there is a lot more to discover within its boundaries. Being thousands of years old, Junagadh has several places which will definitely allure you due to their historical significance. This wonderful town has seen many wars and battles and the presence of numerous ruined monuments prove the fact. The major places where you explore the history of this town include Tomb of Mahabat Khan, Uperkot Fort and Ashoka's Rock Edict. Located in the historic town of Prabhas Patan at a distance of around 6 km from Veraval, Somnath Temple is an important religious place in Hinduism. As it is believed to be the first amongst the 12 jyotirlingas in India where Lord Shiva appeared in the form of a light, it is a prominent pilgrimage site for Hindu devotees. It also attracts innumerable tourists from all over the world due to its interesting history of formation. Even though the present structure was built in 1951, the history of its formation dates back to the 7th century, during the reign of Yadavas, when the second temple of Somnath was built. However, the exact time of its inception is still unknown. Being attacked several times by Muslim invaders, the Somnath Temple was destroyed a lot of times and was plundered more than 10 times. Its formation and destruction continued until Hindu devotees took the pledge of protecting it from being attacked and vandalised. It is also said that the sanctum of Somnath Temple had several invaluable gems and tons of precious stones which were all looted during the invasion. Today, it is built in the Chalukyan style and is located on the western coast of Gujarat. Apart from the historical significance, the peaceful ambience amidst the melody of sea waves makes this temple a must-visit destination. 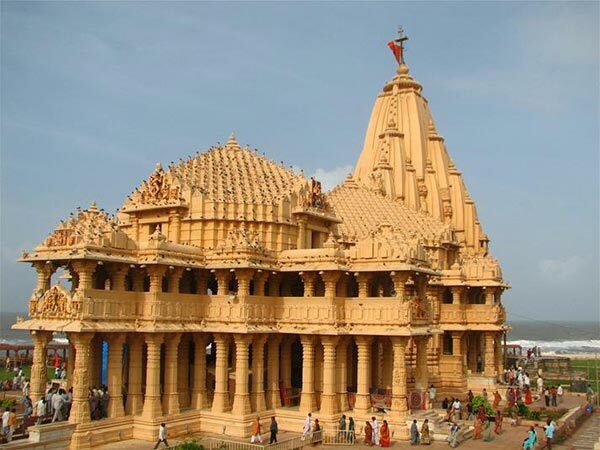 If you are looking forward to enjoying the divine aura of Gujarat, then Somnath Temple should be your next stoppage.